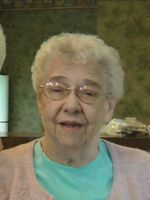 Dorothy E. (Freytag) Barkeloo age 87, of Ashland died Thursday September 18, 2008 at the Good Shepherd Nursing Home. She was born in Ashland on May 5, 1921, the daughter of the late Russell P. and Anna (Larson) Harmon. Mrs. Barkeloo lived all of her life here in Ashland where she was a Homemaker. She was a member of the First Christian Church, active with the Council on Aging and the 39er's Club. She also enjoyed collecting Lambs, she had over 800. Survivors include her daughter Carolyn Stoler of Ashland, and her son and daughter in-law William R. and Kay Freytag of Shelby Also surviving are her three grandchildren; Stephanie and Mark Hastings of PA., Andrew and Shannon Stoler of VA., and Molly and Matthew Henderson of Ashland, and her four great grandchildren; Karson Hastings, Peyton Hastings, Anna Stoler and Brendan Henderson. She was preceded in death by her first husband L. Gilbert Freytag in 1965, her second husband Charles Barkeloo in 1979, her sister Edna Baker, and her two brothers Paul Harmon and Ray Harmon. Services will be held at Heyl Funeral Home on Saturday September 20, 2008 at 11:00 a.m. with Rev. John O'Hara officiating. Burial will follow at Ashland County Memorial Park. Friends may visit with the family two hours prior to the service at the funeral home from 9 to 11:00. The family suggests memorial contributions may be made to the Ashland County Council on Aging, 240 E. 3rd St., Ashland, Ohio 44805.